Prelude: Union General Ambrose E. Burnside’s Division captured Roanoke Island on February 8, 1862. This success provided the Union forces with an excellent base for their next operation, the capture of New Bern. Action: On March 12, 1862, Union land and naval forces under joint command of General Burnside and Commodore S. C. Rowan, arrived at the mouth of Slocum’s Creek. Early on March 13 gunboats shelled the nearby woods. Soon Union infantry landed unopposed and began marching in the direction of New Bern, 16 miles northwest. 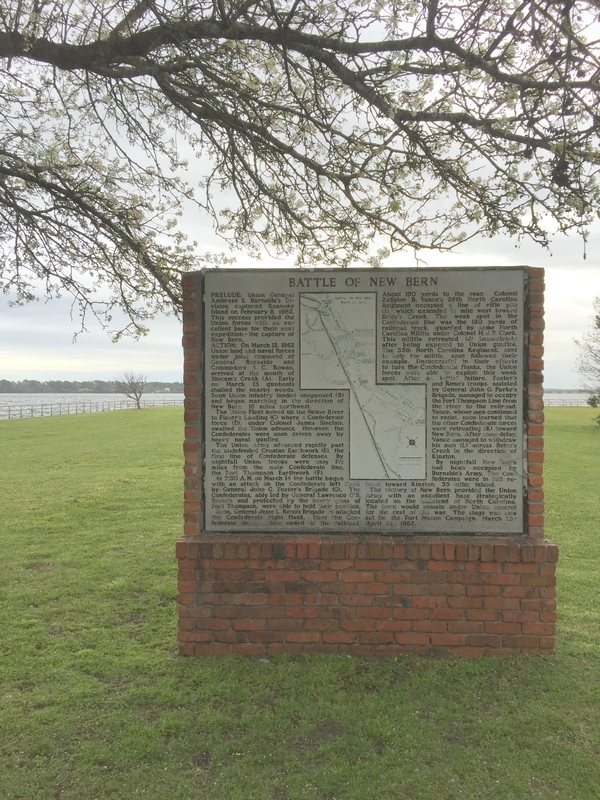 The Union Fleet moved up the Neuse River to Fisher’s Landing where a Confederate force, under Colonel James Sinclair, awaited the Union advance. However, the Confederates were soon driven away by heavy naval gunfire. The Union Army advanced rapidly past the undefended Croatan Earthwork, the first line of Confederate defenses. By nightfall Union troops were only 1 1/2 miles from the main Confederate line, the Fort Thompson Earthwork. At 7:30 A.M. on March 14 the battle began with an attack on the Confederate left flank by General John G. Foster’s Brigade. The Confederates, ably led by General Lawrence O’B. Branch and protected by the heavy guns of Fort Thompson, were able to hold their position. Soon, General Jesse L. Reno’s Brigade attacked the Confederate right flank. Here the Confederate defense line ended at the railroad. About 150 yards to the rear, Colonel Zebulon B. Vance’s 26th North Carolina Regiment occupied a line of rifle pits, which extended 1/2 mile west toward Brice’s Creek. The weak spot in the Confederate line was the 150 yards of railroad track, guarded by some North Carolina Militia under Colonel H. J. B. Clark. This militia retreated immediately after being exposed to Union gunfire. The 35th North Carolina Regiment, sent to help the militia, soon followed their example. Unsuccessful in their efforts to turn the Confederate flanks, the Union forces were able to exploit this weak spot. After an initial failure, Foster’s and Reno’s troops, assisted by General John G. Parke’s Brigade, managed to occupy the Fort Thompson Line from the river to the railroad. Vance, whose men continued to resist, soon learned that the other Confederate forces were retreating toward New Bern. After some delay Vance managed to withdraw his men across Brice’s Creek in the direction of Kinston. By nightfall New Bern had been occupied by Burnside’s Army. The Confederates were in full retreat toward Kinston, 35 miles inland. The victory at New Bern provided the Union Army with an excellent base strategically located on the mainland of North Carolina. The town would remain under Union control for the rest of the war. The stage was now set for the Fort Macon Campaign, March 23-April 26, 1862.